Portland Public Schools to pay attorneys' fees after the district's failed bid to keep paid administrative leave information secret. Portland Public Schools will ultimately spend more than $200,000 to find out that the identity of public employees on leave is, in fact, public information. 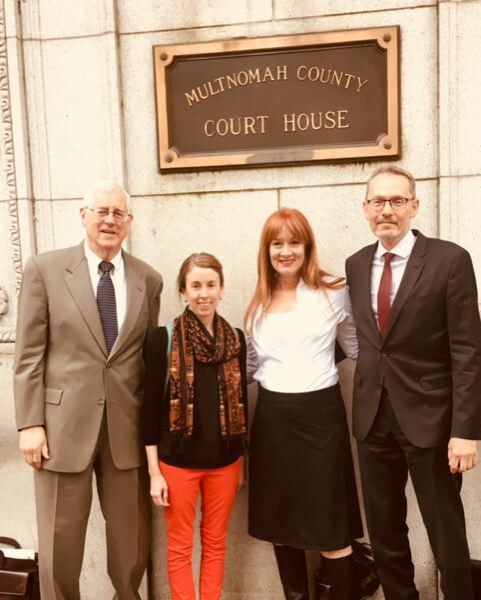 In a ruling Friday from Multnomah County Circuit Court Judge Judith Matarazzo, the school district will pay attorneys' fees and other costs incurred by the Portland Tribune and parent Kim Sordyl in the course of fighting the district's lawsuit to prevent the release of that information. "The amount of time, effort and money it takes to enforce public records laws shows a broken system," said Sordyl, a PPS parent and education advocate who sits on the Oregon Board of Education. "Oregon law is toothless. I'd like to see penalties for employees who intentionally violate public records laws." The two-year battle began with a November 2016 request from reporter Beth Slovic, who subsequently came to work for the Portland Tribune, for a list of employees on paid administrative leave. The longtime schools reporter had received this information routinely in the past, but that time the request was denied. "I never intended for this to be a battle," Slovic said. "It was always surprising to me that PPS decided not to turn over these routine records." Sordyl requested similar information in a separate request, which the district also denied. The pair's appeals to Multnomah County District Attorney Rod Underhill were combined in a March 20, 2017 letter commanding the district to release the information. Instead, the district appealed Underhill's decision to state court by suing the two requesters. They lost that case in May and have released a list of employees on paid administrative leave at least three times since then. "The D.A. 's ruling left some ambiguity about how we handle public records. We felt we needed clarity from a legal perspective and a contractual perspective," district spokesman Harry Esteve said. "Our desire is always to be as transparent as we can. …Now we have that clarity, and I think it's good for us and I think it's good for the public." The Tribune's attorney, Jack Orchard of Ball Janik, will be reimbursed at least $73,135. The estate of Sordyl's first attorney Richard VanCleave, who died April 1, will be reimbursed $61,120. Her second attorney, Jeff Merrick, will receive $22,250, plus other costs. The district, according to spokesman Harry Esteve, spent $46,256 in attorneys' fees on this case. Slovic said she warned the district that the fight would be expensive and that they would lose. She said she feels conflicted over exactly how expensive it ended up being. "On the one hand, PPS needs to be appropriately (dissuaded from) withholding records that are in the public interest," she said. "On the other hand, I'm very aware that $200,000 is two teachers' salaries." Though, Slovic noted, the money will likely come from insurance and not the general fund, "it's real money. I wish they had never taken this action." "Agencies, including PPS, don't seem to mind paying hundreds of thousands of taxpayer dollars on attorney fees to prevent transparency," Sordyl said in an email Monday. "...I believe it was intentional retaliation for my 7-year history of advocating for students and staff in PPS." Orchard, the Tribune attorney who works for Oregon Newspaper Publishers Association member companies, noted that during that same time period the district was also criticized for secrecy around toxins in school water, teacher-student sexual assault cases, and other controversies. "From that standpoint, I think PPS's conduct at that time was a particular disregard of the public records law," Orchard said. "Certainly (Judge Matarazzo's) rulings were a message that just because a public agency has made a decision to withhold records doesn't mean that's the end of the discussion." Slovic, now a Clark College journalism instructor, said the agency will ultimately benefit from having the information she sought in the public sphere. "I think ultimately PPS won even though they lost because — as I said at the outset — it is in the public interest to have this information," she said. "It is in PPS's interest to allow sunshine to hit these records." UPDATE (10/8/18): A quote from Beth Slovic was clarified.